Robust, one-handed operation, completely autoclavable, high precision and Easy Calibration technique for lasting reliability. The piston-operated pipette Transferpette® S provides maximum versatility and optimum quality over the entire volume range. 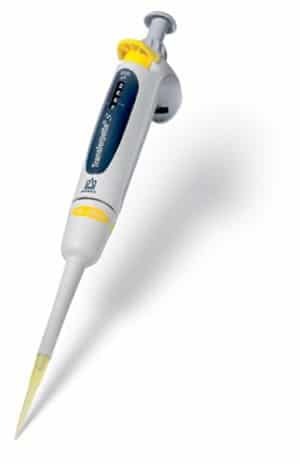 There are 9 single-channel pipettes with adjustable volume and 8 single-channel pipettes with fixed volume available in the 0.1 μl to 10 ml range. There are 5 different multichannel pipettes available in the 0.5 to 300 μl volume range. The Transferpette S accepts universal tips. Optimal performance will be achieved with the use of genuine BRAND premium tips.